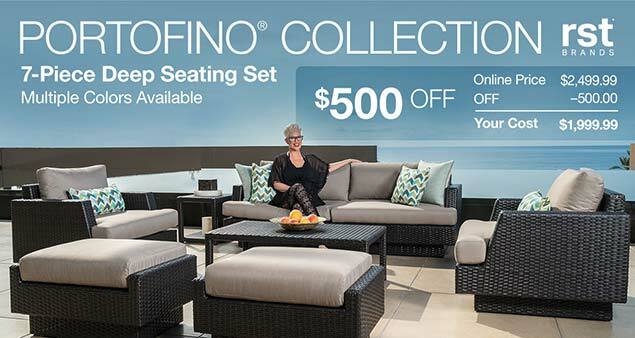 For only a few more days the Portofino Comfort 7-piece Seating Set will be on sale on Costco.com. You may have seen this deep seating set in the April 2018 Costco Coupon Book, as it is $500 off through May 13th. Since it is such a good value ($1999 after coupon) and we’ve been in the market for a new outdoor patio furniture set for quite a while, we pulled the trigger and got the Portofino 7 piece seating set from Costco. We are so impressed we thought we’d write a review of it so you can jump on the deal before it expires! As you probably know, Costco only stocks high quality items that they can stand behind and that their unrivaled warranty can stand behind. The Costco Portofino 7-piece Seating Set is definitely one of those items that fits that bill. First of all, it’s extremely comfortable. There’s a reason the name Comfort is in the product title. It has upgraded 6″ comfort cushions that are built to last. Those are wrapped with Sunbrella fabric, which is also top of the line, and has proven over the years to not fade. You can probably find lower cost patio furniture at Walmart or Home Depot but those sets aren’t going to use the high end materials that this set uses, and will ultimately break down after a year or two, causing you to spend even more money in the long run. 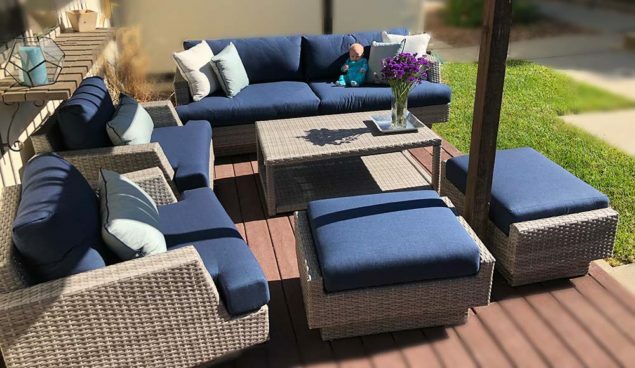 Also, all Portofino Collection items use our exclusive SolarFast, 100% virgin Outdoor Resin Wicker that is rated at 3000 UV hrs or 3 years of direct sunlight exposure. Those are some of the highest standards in the industry. One thing we didn’t really think about beforehand was how nice it is to have a bunch of different pieces vs having a sectional. When you have a bunch of different pieces it gives you many more options on how you can arrange your space. With a sectional you’re pretty limited in your arrangement and it will fit in less spaces. Since we have a smaller deck it was really nice to be able to try a few different arrangements with the patio furniture to see what would work best for our space. There is no other set on Costco.com that seats as many people for this low of a price. We highly recommend it if you’re thinking about getting an outdoor patio furniture set!